Pioneering entrepreneurship program Venture Engine is within sight of its finale, which is scheduled to take place on Wednesday, February 21st, 2019 at Hatch – Sri Lanka’s largest co-working space. Following three intensive rounds of filtering, 18 startups have now been short listed to battle for their final place at the February 21st finale where they will pitch to an international panel of investors in selecting the top fundable start-ups for this year. Alongside the filtering sessions, participants were required to take part in a series of workshops conducted by experienced professionals from diverse fields. Venture Engine workshops are especially designed to coach budding Entreprenuers to set up and scale their ventures & build robust value propositions enabling them to become ‘ready for investment’. 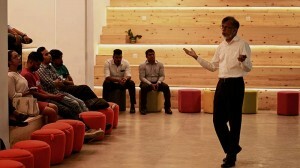 According to Prajeeth Balasubramaniam, Founder of Venture Engine, the Lankan Angel Network, and General Partner at BOV Capital, “The ultimate purpose behind the program is to ensure that applicants benefit through feedback, expertise and overall experience gained throughout the program regardless of funding. For this year’s workshop sessions, we put a lot of thought into areas that entrepreneurs really struggle with, such as developing a go-to-market strategy and communicating their business plan in a tough two- to six-minute pitch. We strongly believe start-upscoming out of this year’s program will have a competitive edge over others given the versatile knowledge they have gained through these comprehensive workshops.” Venture Engine was co-founded by BOV Capital and the Indian Angel Network. Kicking off on November 1, 2018, with entries closing on December 10, 2018, the 7th Venture Engine entrepreneurial program witnessed a whittling down of entries to the 45 most promising submissions, selected based on the strength of their business plans. Participants were then required to take part in a preliminary, two-minute elevator pitch to a panel comprising of notable Angel Investors from the Lankan Angel Network and industry specialists. A key aspect during the program’s initial filtering was to engage and evaluate the team behind each start-up, which has traditionally influenced investors on the decision to invest. “Eventually what creates value for us as investors is how well the team can execute,” revealed Mano Sekaram, Chairman of the Lankan Angel Network. The Lankan Angel Network, Sri Lanka’s pioneering Business Angel Network, which has collectively invested over Rs. 2.2 billion in 30+ start-ups is the main organizer of Venture Engine. Filtering rounds and workshops for Venture Engine this year were held at HATCH, the official venue partner for the 7th Venture Engine and is located at 14, Sri Baron Jayathilaka Mawatha, Colombo 01. Also supporting the current cycle of Venture Engine, as its title sponsor, is Indian Venture Capital firm Aavishkaar, with longtime supporter Dialog Axiata, Sri Lanka’s largest telecommunications service provider, once again coming on board. This year’s top 18 finalists include TravelSpends, Kimbula Kithul, mintpay, SolarDeals.lk, Porukki, Loop Learning, Project 360, Niwadu Deals, LiveRoom, Real Pixels, Fositive, Tripmo, Helios P2P, Strive.lk, SparkGrid, Breadfast.lk, Ecosteem and SIXER VIDEO. “I feel privileged to be one of the short listed start-ups at this year’s Venture Engine program. The program overall has helped us immensely in fine-tuning our business plan and focus on areas which we hadn’t thought about. Over the last two months, we’ve had incredible amount of support from the Venture Engine team and it’s a great platform for any budding entrepreneur or start-up to build their business,” commented Gayantha De Zoysa, Founder/CEO of Strive.lk. The workshop session started off with an introduction to the business plan and pitch deck – an important strategic tool for an early stage venture. It was conducted by Lankan Angel Network board member and experienced Angel Investor Anarkali Moonesinghe. Participants were coached on ways to elevate their initial business plan that will help them progress through the next levels of the program as well as set their business on the path of success. Well-known corporate trainer Sandun Fernando hosted the second workshop on preparing and presenting the pitch deck. This was the first time this workshop was introduced to the program, with the goal of helping participants to fine-tune their presentation skills. Given the limited time presenters get to convince an investor, it is key that they are able to communicate main points clearly. Additionally, Aavishkaar’s Shashvat Rai facilitated a workshop on the startup funding cycle, valuation methods and up/down rounds where participants learned a great deal about how and when to raise money and plan for future exits. Another new workshop, “Go-to-market” by Mohit Pande, currently Senior Vice President at Linear Squared, with extensive experience at Google (5 years) and Microsoft (12+ years), focused on strategies related to best utilizing limited resources to gain traction at different stages of a start-ups life cycle. Next was the finance workshop conducted by reputed corporate trainer Hussein Moosajee focusing on financial essentials for start-ups. Going beyond theory and basic accounting, participants were coached on key matrix used by investors during and after fund raising, which is an area most entrepreneurs struggle with. The session highlighted ways to best utilize funds raised, managing cash flow, calculating burn rate, customer life time value, customer acquisition cost, age analysis, segment reporting, pricing, and defining KPIs, etc. The final and most important workshop centered on all legal aspects essential to a successful start-up. The Legal Workshop by Arittha Wikramanayake, Senior Partner at Nithya Partners and Patron of the Lankan Angel Network, covered topics such as company structures and the key must-haves in a shareholder agreement for Early- and Series A-stage ventures, protecting the rights of founders, role of the Board, good governance, the various classes of shares, IP, Trademarks and copyrights, etc. “I gained a lot of knowledge through the Venture Engine workshops, it helped us look at the market with a wider angle, to think out of the box and implement our business model out of Sri Lanka. It also helped us modify our original Business Plan, into a more comprehensive one,” noted Ihthisham lye, Founder/CEO of Breadfast.lk. “The Venture Engine workshops cover the fundamentals and so much more that every entrepreneur needs. The caliber of the speakers and the interactive sessions, where no question is considered too small or ‘silly’ encourage entrepreneurs at different stages and different strengths to get the help they need from experienced local and international specialists. Getting this learning while you build your company is business school with real stakes,” said Chanchala Gunewardena, Founder of Kimbula Kithul. Attending this year’s finale are key Venture Capital personalities from Avendus Capital, Accel, Sequoia Capital, Aavishkaar, Khazanah, Temasek, Crescent Group (UAE) and Uber, as well as prominent domestic investors, have already consented to participate as guest judges at the February 21st finale. Did you miss out on the 7th Venture Engine program? You have a second chance to interact directly with international and local investors. Get in touch with the Venture Engine team on 0777039889 to reserve your stall at the finale.